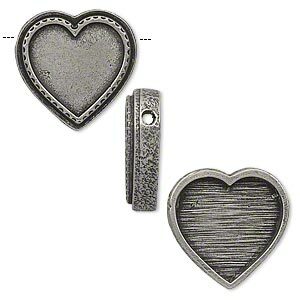 Slide, antiqued pewter (tin-based alloy), 25x24mm single-sided heart with 18x19mm heart recessed bezel setting, 2.5mm hole. Sold individually. 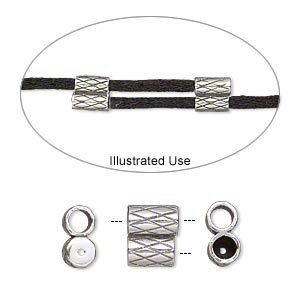 Antiqued slide has a 2.5mm hole for stringing on beading wire, leather or suede cord, ball chain and more. Customize the slide using the 1mm deep recessed bezel setting for personal photos, decorative paper or other items. Bezel setting adornment can be finished with a top coat of glaze such as ICE Resin® or Mod Podge®. 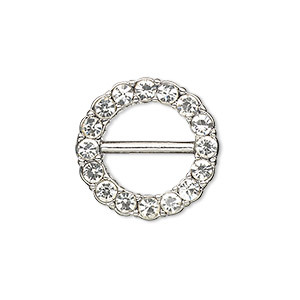 Slide, antiqued silver-finished "pewter" (zinc-based alloy) and Czech glass rhinestone, clear, 21mm single-sided round, bar on back. Sold individually. 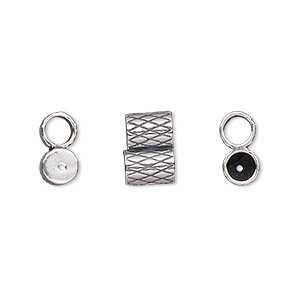 Clasp, JBB Findings, slide, antiqued sterling silver, 7x6.5mm textured double-round tube, fits 2mm cord. Sold per 2-piece set. 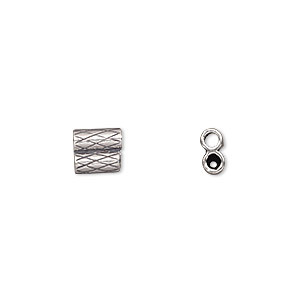 Clasp, JBB Findings, slide, antiqued sterling silver, 7.5x6mm textured double-round tube, fits 1.5mm cord. Sold per 2-piece set. 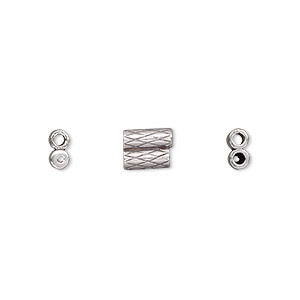 Clasp, JBB Findings, slide, antiqued sterling silver, 9x7.5mm textured double-round tube, fits 3mm cord. Sold per 2-piece set. 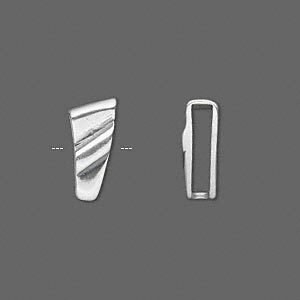 Slide, antiqued sterling silver, 14x10mm fancy. Sold individually. Clasp, JBB Findings, slide, antiqued sterling silver, 11x7.5mm textured double-round tube, fits 4mm cord. Sold per 2-piece set. 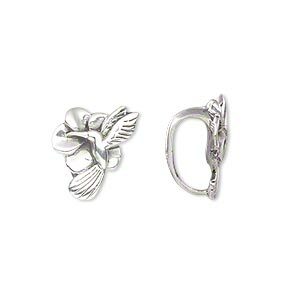 Slide, antiqued sterling silver, 16x11.5mm hummingbird with flower, 5mm hole. Sold individually. 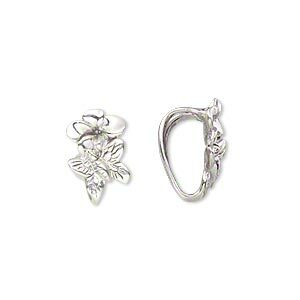 Slide, antiqued sterling silver, 15.5x10mm flower with butterfly, 5mm hole. Sold individually. 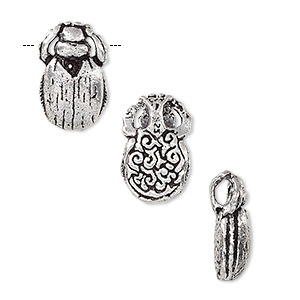 Slide, antique silver-plated white brass, 16x10mm two-sided beetle with 2.5mm hole. Sold individually. Minimum 2 per order. 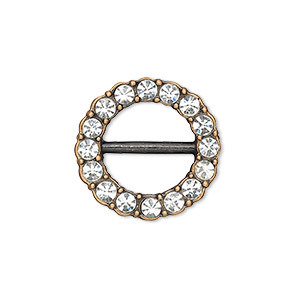 Slide, antiqued copper-finished "pewter" (zinc-based alloy) and Czech glass rhinestone, clear, 21mm single-sided open round, bar on back. Sold individually.